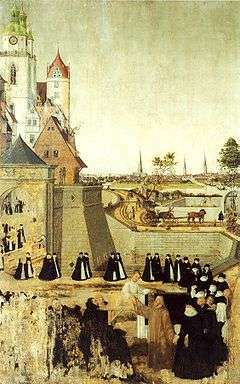 Resurrection of the Widow's son from Nain, altar panel by Lucas Cranach the Younger, c. 1569, in the Stadtkirche Wittenberg. The location is the village of Nain, two miles south of Mount Tabor. This is the first of three miracles of Jesus in the canonical gospels in which he raises the dead, the other two being the raising of Jairus' daughter and of Lazarus. 11 Soon afterward Jesus went to a town named Nain, accompanied by His disciples and a large crowd. 12 And when He arrived at the gate of the town, a funeral procession was coming out. A young man had died, the only son of his mother, and she was a widow. And a large crowd from the town was with her. 13 And when the Lord saw her, His heart was filled with pity for her, and He said to her, “Do not weep”. 14 Then He walked over and touched the coffin, while the pallbearers stood still. Jesus said to the dead man, “Young man, I say to thee, arise!” And he who was dead, sat up and began to talk, and Jesus gave him back to his mother. 16 Then they all were filled with awe and praised God. And they said, “A great prophet has risen among us”, and “God has visited His people”. 17 This news about Jesus went out through all the country and the surrounding territory. 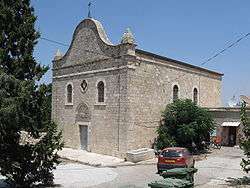 Widow's Son Church at Nain which is the site of the miracle. The raising of the son of the widow of Zarephath, by the Old Testament prophet Elijah, is seen by Fred Craddock as the model for this miracle, as there are several parallels in the details. The woman in the story had lost both her husband and her only son, so that there was no one left to support her. As she could not have inherited the land, the loss of her only son would have left her dependent on the charity of more distant relatives and neighbours. ↑ Sinclair Ferguson, Preaching Christ from the Old Testament, Proclamation Trust, 2002, page 12.